We need more than minimum wage increase, everyone need equivalent wage increases, and we need to protect from displacement of labor. Labor is a market that is as unstable as any commodity, but when it crashes people die, and that’s why it’s one commodity that we must always protect. A system like cap and trade would best protect domestic labor. It’s more of a floor and trade that I am proposing. It a wage system for the future, a future with more robots in warehouses and retailers and human laborers… a future where algorithm and software programs replace educated specialized workers across an entire industry. Imagine a day when an entire workforce is put out of work. Other industries dump labor, like a crashing market. Companies could start racing towards more automated processes too fast, then the system crumbles. This happens more gradually, but a nearly jobless society is inevitable. Even a small impact on labor can have huge consequences on the economy. When unemployment rises 10%, we dive into depression. When the stock market crashes, stocks are frozen… same should go for labor. Big businesses may already fear a labor market freeze. Walmart and McDonalds, for example, have been quietly downsizing. We should just have precautions; we will need them one day soon. Nothing is more important to mankind than protecting the need for human labor. Here’s how it works: a corporation must employ labor in proportion to profit. If they try to lay off anyone, they need to find a company that will take the labor off their hands, otherwise they are responsible for that 80% of the person’s salary until they find a job with 100% of original salary. The freed labor market, like an invisible hand, will produce wonderful results for labor… with this floor and trade system. Since labor is tied to profit, companies that make less profit will have no problems. There could be some mid-sized businesses where the owners have to cut back on profits and may already be over extended in personal expenses. So, a few bad businessmen might not make it. This minor issue is quickly over shadowed. Hiring incentives for small businesses will be needed at first. We need to directly loan to middle class individuals with business ideas. This will create more than enough jobs. Some big businesses will even give start ups free employees when they need to dump surplus jobs, rather than pay for their government jobs. Employees, as a result, will take more care in their companies success… so that their company won’t close down. If their company is doing well, but doesn’t need as much labor, they will easily find another company to hire their well trained and successful staff at the same salaries. Companies may offer early retirement packages. 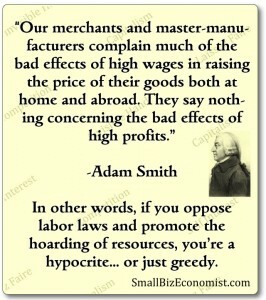 The key is to redistribute profit within the companies, employ everyone, and tie all wages increase to price inflation. Each occupation and job will have normal salary variances. This concept allows businesses to get creative and excited to invest in labor again. 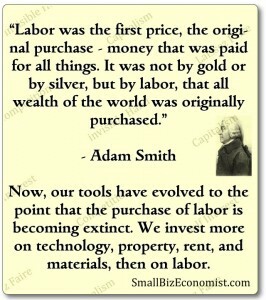 This way we will be increasing the value of human labor, instead of making it less competitive. Companies will invest in better training and take more pride in their employees as well, so that they will have greater success trading them if needed. People will change jobs like normal, for advancement. People will be fired as normal, but rules still apply, if that person can’t find a private job than the company can be obligated to pay a basic income to fired individuals to go work in the government sector… thus producing federal revenue immediately redistributed to labor. Companies will try harder to fix employees than fire them and risk paying. Companies will prefer to help find them a new job than fire them. Also, people won’t want to be fired and risk being stuck with a government job. For an individual, this system is less desirable than welfare or unemployment, because everyone has to work. It’s good to keep people busy, and find jobs for everyone… or at least pay the basic income. This system would also create the workplace loyalty we all have been searching for. So, in this system businesses invest in government jobs directly, but only when they dump labor. So, I’m developing a variable corporate tax rate that adjusts based on a profit to labor ratio for each company and income level. The less they spend on domestic labor, the more they pay in corporate taxes. We will have to do more calculations to determine the best variable for optimal effectiveness in the United States. Even replacing the income taxes with flat/sin/luxury taxes becomes possible. But an income ceiling might be needed to achieve a flat tax. Meaning, billionaires have to use it or lose it… 1 million a year of new profit per person would be a reasonable ceiling. Everything else gets spent as business expenses, or donated to charity/government. My proposed income ceiling was inspired by conservative economist Mises, who thought it was unwise to let capitalists save so much capital. Taxes are somewhat of a fine/deterrent… there is great merit to taxing spending/sales. Complete tax reform is an option that compliments this new age labor system. We’d have to state taxing internet sales, which is a given anyways. Now, in this system there are never any regulations on employee job choice. This only creates a floor on the number of employees and salary of employees. If you can get the job it’s yours, as always. The idea here is that full labor is the best economic goal, production and profit should not be the leading economic principles. If we raise the minimum wage before this system is adopted, some small businesses that depend on low wages will be run out of business due to minimum wage increases; larger businesses will survive better. This will swell the unemployment prior to the floor and trade system. The minimum wage increase will just increase the number of people requiring government jobs when the private industry won’t hire them. Increased social program payouts and increased taxes on the top 5% are better stop gaps. The variable corporate tax will do a better job than minimum wage increases, but one of these needs to be implemented asap. In the labor floor system every non disabled person works on something, even disabled people have the free opportunity to work. Taxes will be taken from the top tax brackets in proportion to the need of government labor due to unemployment. 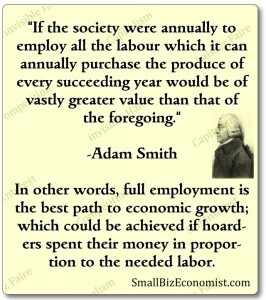 It would be ideal if very little government labor would be needed, but unfortunately unemployment exists in capitalism. There are already millions of government jobs that the private industry would mostly not hire if given government tax breaks… like the GOP wants. Giving corporation more money doesn’t translate to more jobs. Tax breaks just mean government layoff with no private companies to hire the former government workers. We’re not penalizing success here, with possible taxes on the rich… to pay for government labor. In fact, I think getting into a higher tax bracket, or breaking through the income ceiling, is a badge of honor. You could say these people almost mother or nurture the whole country. People who produce the most jobs, private and public combined, are the greatest heroes. But when they refuse the public part, they’re just reaping from the system. Big businesses will greatly oppose this new concept. Perhaps I shouldn’t use the word trade, because the people aren’t sold into the companies, we are just inflating labor directly to keep all labor contracts rising at an equivalent rate to profit. With the word trade, slavery jokes will be made. Although, it is the oposite concept… people are really trading the company contracts. Freedom is not removed from anyone, except those who lay off while profiting more. This will free labor from the old ugly slave trade of which we still reek. It puts labor on the pedestal, right next to profit. So, what happens to the people whose company closes down, and can’t find work? They get government jobs… literally anything to keep the hands and mind sharp… construction, writing, art, moderating, riding a bike to generate power, becoming a logic police officer, working in a local garden, any busy work we can find until we transition into a nearly jobless society. It is important that everyone stay busy, regardless of importance of the job, so that people aren’t compelled to retire to apathy too easy. Part time work is good for health. Good jobs will be more abundant. A business’s desire to produce good employees, that can be effectively traded, will fix workplace apathy as well. It is clear even our current economy has a lot of job apathy, the middle class seems at times to be more jealous of the disabled than the successful. This new concept will correct this labor apathy over time. The greatest part is that the upper middle class will grow greatly, which is where everyone really wants to be and really want to realistically strive for. When a big business sells off workers, they will offer incentives to the new businesses hiring them. They may even offer up to $100,000, upfront, just to take an employee off their hands. Big business will be directly investing in start ups. Some may even split off smaller companies instead of growing too large. Corruption must be monitored as always. Recent debate has started over the basic income principles. This may take hold in parts of Europe with the greatest social systems. They are finding that the minimum wage and welfare programs are less effective at producing jobs and economic growth than a basic income for everyone. This means that you don’t have to work if you want to live at the poverty line. Yet, many people who have jobs and good income, will use their additional basic income to invest in a new business, or spend it back into the economy. The point is that everyone gets to take part. When everyone is involved in the system, it grows. I would like to invest my time on this project. It will take a great amount of research and calculation to confirm the economics. Then, it will take great effort to spread the word and get public support for these laws. It will take time to refine the laws, after great and thorough debate.